What Are the Benefits of Eating Banana Peels? The flesh of the banana is a rich source of many nutrients and considered high in carbohydrates. The sugar content in a banana is highest when the skin has turned completely black, which indicates that the starches have all been converted to sugars such as sucrose, fructose and glucose, as cited in "Biochemistry of Human Nutrition." The flesh is high in vitamins B-6 and B-12, magnesium and potassium, but also contains some protein and fiber. In general, the peels of fruits contain additional nutrients and fiber that complement the inside flesh. The peels of apples, oranges and kiwis are good examples and more commonly eaten in Western countries, although banana peels seem to be better appreciated in India and Southeast Asia. Banana peels can be eaten raw, although they are purported to be ropey and have an unpleasant taste. Waiting for the fruit to ripen makes the skin much thinner, a little sweeter and easier to chew, according to "Contemporary Nutrition." Some people prefer to boil the peel for 10 minutes or so before eating it, putting it through a juicer or blending it with other fruits. 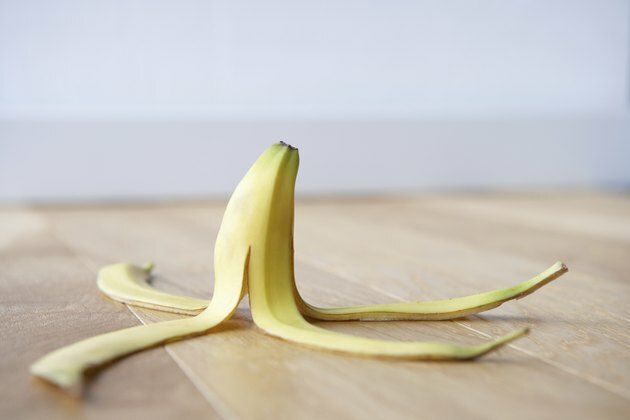 In Asian countries, banana peels are cooked with their flesh or fried on their own. Cleaning commercially grown bananas before you eat the skins is essential due to all the spraying that bananas are subjected to.